Once you sink into this Power Lay Flat Reclining Loveseat, you'll never want to get up! This piece features generously cushioned pillow arms, as well as channeled seat and seat backs, ensuring you enjoy exquisite comfort at at all times. Furthermore, the lay flat recline mechanism makes it so that you could realistically sleep in your loveseat, while the power mechanism will smoothly and conveniently help you achieve that position. Finally, choose between a luxuriously soft Chocolate, Pewter or Camel fabric. The Branson Power Lay Flat Reclining Loveseat with Storage and Cup Holders by Catnapper at Standard Furniture in the Birmingham, Huntsville, Hoover, Decatur, Alabaster, Bessemer, AL area. Product availability may vary. Contact us for the most current availability on this product. After a long and hard day's work, you'll love having this collection of upholstered living room reclining seats in your home for you to collapse in and relax. 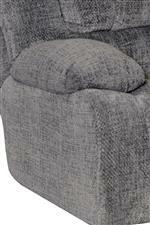 You can choose between a recliner, reclining loveseat or reclining sofa, all of which come in manual or power recline. Furthermore, add the wedge piece to bring together the loveseat and sofa to create an expansive and luxurious sectional. The Branson collection is a great option if you are looking for Casual furniture in the Birmingham, Huntsville, Hoover, Decatur, Alabaster, Bessemer, AL area. Browse other items in the Branson collection from Standard Furniture in the Birmingham, Huntsville, Hoover, Decatur, Alabaster, Bessemer, AL area.